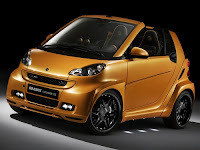 Well anyone who has ever said the smart is slow has never seen the new Brabus Ultimate 112 as while its not going to be breaking any records with a 0 - 60 in 3.9 seconds. Ok that's Km/h, but its still fast for this size of a vehicle and makes for a while ride behind the wheel. The 0 - 100 Km/h (0-60 Mph) is 9.5 seconds, which is a 3.8 seconds fast then the base smart. BTW that's almost a 30% improvement in performance. While here in Canada and the United States we'll probably never get to see one of these models sold, but if you are interested and have 45,900 Euros ($67,000 USD/CAD) laying around then hop over the pond and pick yourself up one. But I'm guesses at $67,000 plus shipping, duties and everything else needed to get the car road ready the cost wouldn't be anything other then say Mr. Penske himself that could afford one of these. I get to drive it on Tuesday's!